A sleeper feature, QR codes have heavy use in parts of the world. Could they spread with automatic recognition in the Camera app? Why on earth would you want to use your iPhone’s camera to scan a two-dimensional block-and-dot code? How could this possibly have a benefit worth the trouble? Why would Apple have any interest in building this in as an automatic feature within its Camera app? Ask folks in China—and Japan, where advertisers, handset makers, and cell carriers pioneered 2D codes over 15 years ago. Apple says its listening to the Chinese market in adding 2D code scanning, but the benefits will be there for users worldwide. Apple’s addition to iOS 11 will let you open URLs, add contacts, and even join Wi-Fi networks with just the Camera app plus a tap to confirm. While it’s common to ridicule QR codes, that was because of pure inconvenience. With ease, will usage grow? This QR code will never give you up or let you down. You’ve certainly seen 2D codes, which largely appear in the square QR code format pioneered in Japan. 2D codes get used on airline boarding passes, as part of your digital affinity card at Starbucks, or when using a smartphone ticket app at an event. 2D codes distribute binary data across black and white areas to make it easy for software to recognize and convert back into the original bits. Codes include extra data for error correction, because the assumption is that a physical object might be blurry, partly obscured, or have damage. The density is far higher than 1D conventional bar codes. Instead of several bytes, a 2D code can build in from tens to thousands of characters. A third-party app available for years, QuickMark, works just fine, by requires a separate launch. 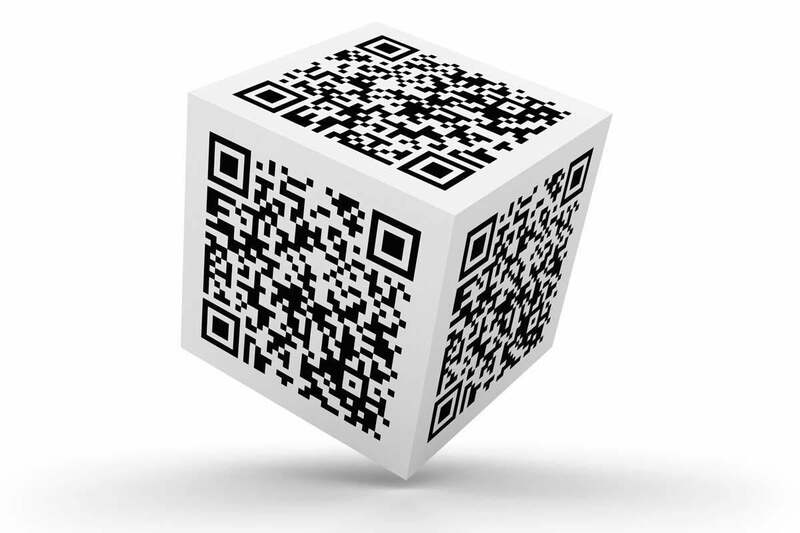 Most QR codes you enter encode a URL, but all manner of data can be placed in one, and several standards have been set that allow contact information or Wi-Fi connection details including a password. Several sites let you convert your web address, text, or other information into a QR code. Google offers QR codes on its Google Charts developer site, which lets you embed a reference that the Google automatically converts into an image. Follow this link, for instance, and you’ll see an image load that’s a QR code pointing to Macworld.com. No programming is needed—just a URL. Another site packages Wi-Fi details into the Android format that iOS 11 supports as well. In Japan, because of a partnership across advertising, phones, and cell networks, QR codes helped people access online resources—especially to grab coupons, follow ad links, and reach retail websites—before smartphones existed and web access was severely constrained. Even punching in an address was an ordeal. They took off for a different reason in China: before the relatively recent support for accessing a website using a name entirely in Han characters (a combined set of ideograms from Chinese, Japanese, Korean, and other languages), it was a real pain to punch in a URL. A QR code bypassed that, providing analog-to-digital glue. That was much less of an issue in America, Europe, and some other markets, and handset makers and carriers didn’t opt in to several competing efforts to incorporate a QR code mode in camera apps or even automatic recognition. Without any native support, you needed to install a third-party app, and that’s no path to full-scale adoption unless there’s something incredibly compelling. Instagram was compelling; scanning QR codes to get a coupon not so much. Google decided QR codes were the bomb several years ago, and started using them with Google Play, some of its local branding for retail stores, and other products. Android didn’t have native QR code support, but some phone makers offered various ways to scan them. Motorola added automated scanning in its camera app in August 2015, for instance. Unless you use a particular app that uses proprietary or single-category codes, like Walmart’s for in-store payment or a second-factor authentication app, it’s possible you’ve never scanned a 2D code. 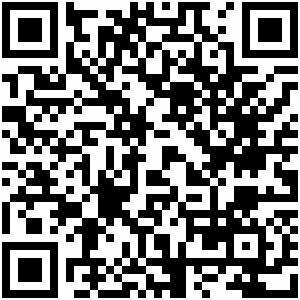 In fact, there’s a joke site created in 2012 called Pictures of People Scanning QR-codes. The joke? There are no photos. Why scan instead of typing? When a QR code comes into the field of view of the camera, it’s recognized, and you’re prompted that you can take action, like opening a URL. Integrating QR code automated recognition in iOS 11 solves the chicken-or-egg problem. While I saw and reported on spates of interest in 2D codes over the last eight years, they always fizzled because they required too much effort. Now, Apple provides an asymmetrical benefit: the feature, on by default, requires a user to do nothing, and it’s discoverable if you happen to hold your camera up and a QR code is anywhere in the frame. I expect many people will be surprised by it. Apple, like Motorola, has built in a safeguard. 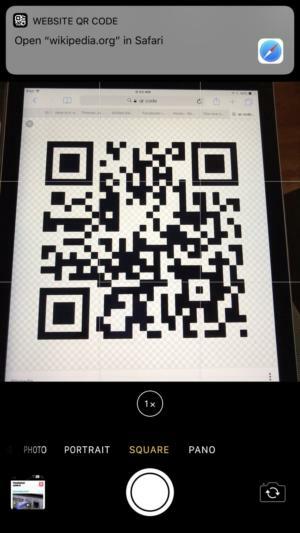 Scanning a QR code doesn’t automatically take action on it. That would be horrific, because imagine people tagging things with unspeakable images reached by simply scanning. 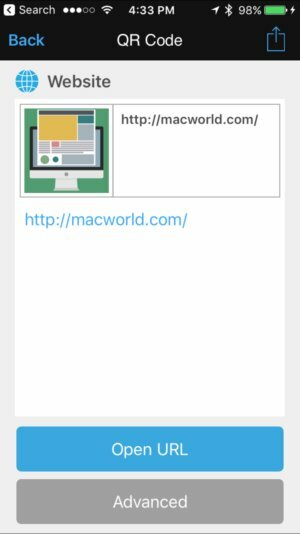 Instead, you get a preview of the URL in full, the contact’s name or the Wi-Fi network, among other categories, and have to tap to proceed. We’ll likely see abuse of this, but because it requires a physical interaction, it’s unlikely to turn into a viral problem. Some of the best uses of these codes I’ve seen are site-specific ones, permanently installed, often in a subtle place, near a monument or location next to text information. This lets someone scan and pull up a wealth of information. On the advertising front, QR codes offer the benefit of tracking—yes, real-world ad trackers! While a poster can’t display a unique code for every person who views it, it can embed a source code. A point-of-sale or other device that displays codes can append tracking information. Catalogs and other mass-printed products can have laser-printed unique codes as well. While having a benefit for advertisers, it’s another privacy concern, too. I can also see this as a widely used way to ease access to a Wi-Fi network, as Android users have already found. A cafe could make friends by posting alongside its network name and password a QR code, avoiding users having to type in a password. I also haven’t found a way to exchange contact information that was as easy as an infrared passoff in Palm devices until now. You’ll be able to show someone your contact information on a screen, print it a brochure, or put it on the back of a business card, and it’s just as easy as you texting or emailing them your contact card. Another good bit of glue, and maybe the death knell for business-card scanning hardware. QR codes are among the several features aimed at the market in China. NFC touch-based payment systems like Apple Pay and Android Pay would seem to largely bypass the need for 2D codes at checkout, providing a similar analog-to-digital glue made through physical proximity. So it’s possible we’ll never see that kind of use emerge at scale in the U.S., although NFC payment remains available at only a subset of all retail locations nationwide. 2D code payment can happen through a software upgrade to any point-of-sale system with a screen, while NFC requires new hardware. Apple’s integration would conceivably allow URL schemas tied to payment apps, thus allowing a Camera-based scan to ask if you want to open a URL in a given app, providing a simple workflow. I’ve been expecting a QR code usage breakthrough for many years, because it felt like the utility they provided were enough of an advantage that Apple or Google would feel compelled to roll out it. They resisted, possibly because it seemed like a passing fad that AirDrop, NFC, and other technology would make it pointless. But the world of atoms is surprisingly persistent and effective. Despite my interest, I’ve referred folks to the Pictures of People Scanning QR-codes Tumblr because it’s a good laugh. But now, I think it’s likely that it could start filling up with photos.